Rudolph Andrew Bukich (September 15, 1930 – February 29, 2016) was an American football quarterback in the National Football League between 1953 and 1968. He played college football at the University of Southern California. Known as "Rudy the Rifle" for his uncommon arm strength, he tied a National Football League record with 13 consecutive pass completions in the 1964 season. One year later, he was the second-leading passer in the league. Bukich was the starting quarterback in his senior year at Roosevelt High School in St Louis, Missouri, on a team that did not win a game. He played one game as wingback when Roosevelt tried to upset eventual league champions Cleveland by surprising Cleveland by playing the single wing. Bukich earned a football scholarship to Iowa State University as a wingback. He then transferred to the University of Southern California. During his senior year, Southern California went to the 1953 Rose Bowl. After the starting quarterback (an All-American) was sidelined with injuries, Bukich came in and conducted a drive, completing all but two of his passes, that resulted in the only score, for USC to defeat Wisconsin, 7–0. Bukich was selected as the Most Valuable Player in the game. After his career, he was inducted into the USC Trojan Hall of Fame and, later, into the Rose Bowl Hall of Fame. 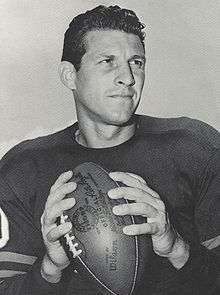 Bukich was selected in the second round of the 1953 NFL Draft by the Los Angeles Rams. He would go on to play for the Washington Redskins, Chicago Bears, and the Pittsburgh Steelers. Bukich's greatest performances were during his second stint with the Bears. He was a quarterback with the Bears when they won the 1963 NFL Championship Game (Bill Wade was the starter throughout the season). Bukich replaced Wade during Week Four against the Baltimore Colts after Wade completed just 5 of 21 passes. Bukich played the remainder of the game, completing 6 of 7 passes with a touchdown pass to Ronnie Bull, which was the deciding margin of victory. Bukich died on February 29, 2016. ↑ Coppock, Chet (October 4, 2013). "1963 season: Bears defeat Colts 10-3 at Wrigley". Chicago Bears. Retrieved October 4, 2013.